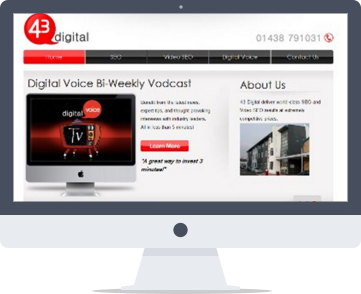 43 Digital offer premium Video SEO and search marketing services to large brands and corporate organisations. 43 Digital offer premium Video SEO and search marketing services to large brands and corporate organisations. They required a website which would utilise very unique and cutting edge design techniques to sell their services. We designed a completely custom built website with CMS, so they could update the website when required. The project also required video integration with a custom built wordpress design, using designated placeholders. *Please note that since publication 43 Digital has re-branded their website and contents.